This is a recipe that I got via my friend Minnie in New York, that she had modified from another recipe that had been modified from yet another recipe out there. The way it usually goes. My version differs quite a lot in the end I think, and I am keen to try on of the more original versions as well, but the first time I did these I went with what I had at hand, and my version has remained like that since. Because of the quinoa the consistence is a bit different than from the raw or no-bake bars/cookies/fudges I usually make - they are a bit lighter, although still a lot to munch on. These somewhat reminds me of a "potato pastry" (perunaleivos/potatis bakelse)! This association will of course only open up to anyone here in Finland, where that is a very dense, chocolate pastry. The actual recipe used maple syrup instead of dates but I only had the later (plus I am very fond of dates and it kind of makes the recipe a little bit healthier) and it did not have sunflower seeds, but I did not have as much almond butter as the recipe suggested plus I like the buttery texture that sunflowers get when mixed, which makes whatever it is that you are making yummier. Cook the quinoa. 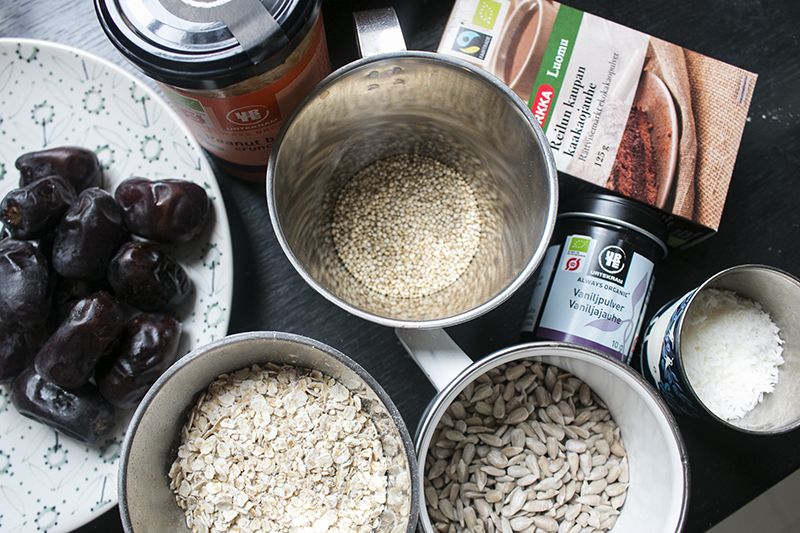 Mix the sunflower seeds with the oats rather smooth in a mixer. Add the dates one by one and mix to a paste. Melt the coconut oil in a pan on low heat (coconut oil melts at around +25 already) and stir in the cocoa, vanilla, coconut and cooked quinoa. Let cool for a minute or two and add this to the mixer and blend for a few seconds so that everything has mixed well. Form into desired shape with a spoon (balls,loose scoops, rolls or press out in a pan if you want to cut them into squares) in cupcake molds or in a pan covered with baking paper and place in the refrigerator for at least half and hour. 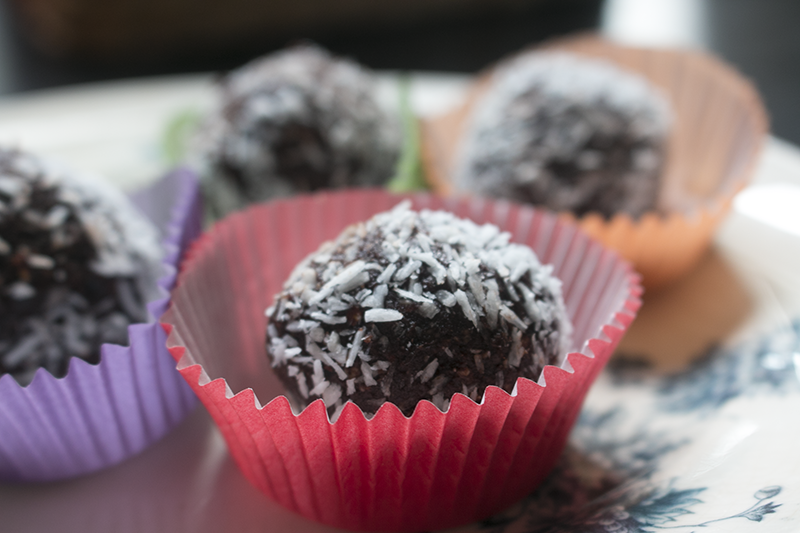 I rolled my cookie-balls in coconut. The second time I made these I forgot about the how-to and just mixed everything one by one in the mixer (the same order though, seeds first quinoa last) and it turned out really good as well. I have done this with both peanut butter and almond butter (and the last time with no butter as I was out), so it is a matter of taste what you prefer. Also the amount of cocoa powder can be adjusted a but to your liking, I've done lighter and darker versions, and leave out the coconut if you are not a fan, perhaps add some more oats instead. I am a fan of bitter almond and added a few drops of bitter almond essence which gave me even more potato-pastry vibes! You could manage to do these without a mixer as well - just leave out the sunflower seeds and add more nut butter instead, and mix with a fork. The cookies will turn out a bit more sticky and loose then, but we know they will taste good nonetheless!